The News app could be a lot better than it is today. At first blush it seemed like my lengthy, App Store-wide search was over. While everyone else was talking about Apple Music in the days following last year’s WWDC keynote, my attention was squarely focused on News, Apple’s answer to the Flipboards and Feedlys of the world. Before my love of music comes my love of the written word, and the idea that Apple was finally making an app dedicated to the articles I want to read was way more exciting than an overdue streaming service. Admittedly, my needs aren’t simple—I’m a news junkie who wants to read anything I can get my hands on. I thought that after six years of using an iPhone, I would’ve found my holy grail: something customizable that lets me save and share articles as I go about my day, recommend things I might have missed, and update me on what’s breaking or trending, all in a clean, easy-to-read format. A few of the apps I tried came close, but none got it perfect. So when Craig Federighi promised Apple News would deliver “beautiful content from the world’s greatest sources, personalized for you,” my interest was piqued. Watching the WWDC keynote, it seemed like it would fill every one of my needs and quickly become my go-to news client, but at launch, News was a victim of its own ambition, trying at at once to do too much and too little, not unlike its relative, Apple Music. Still, just as with the streaming service, there’s a lot of potential in News. With a few tweaks, it could become it could become the best in its field—and maybe even save the industry. 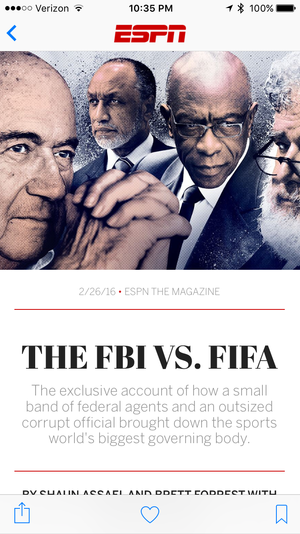 As with most Apple apps, News looks great. It presents stories with clean layouts, full-screen images, and crisp typography, for one of the most pleasurable reading experiences I’ve had on an iOS device. An article in Apple News Format (click to enlarge). But all stories are not created equal in Apple News. Peppered between the rich, native presentations of full articles are truncated stories that need to be viewed on the associated website. While the browser that opens may be as optimized for reading as it can be, it still waters down the Apple News experience, interrupting both the physical and visual flow of the app. And Apple News Format stories are few and far between. When it launched, a few publishers were chosen to showcase the beauty of the format, but things haven’t grown so much from there. Despite detailed documentation being available in the iOS Developer Library, Apple News Format is still marked with a “Coming Soon” tag, and it’s unclear if Apple is expanding it to more publishers, or how the company is (or isn’t) promoting the framework. Furthermore, scrolling through the News app’s feed gives no indication of which articles take advantage of Apple News Format, something that Facebook accomplishes with a small lightning bolt symbol next to Instant Articles. A greater emphasis on Apple News Format would instantly elevate Apple News and give readers an extra reason to open it a couple extra times a day. But even more an design, the biggest hurdle any news app needs to clear is organization. It seems like a simple enough concept—-collect articles I’m interested in, filter out the ones I’ve read, show me what I’m most interested in first, and let me easily find and add new sources. It’s not that Apple News doesn’t do these things—it’s that it doesn’t do them any better than other services. Like Apple Music, Apple News’ biggest strength is discovery. Aside from picking your favorite “channels,” the app also does a fine job of collecting news about topics you have expressed interest in, but for the most part, finding stories is mostly a hit-or-miss affair. There’s no way to gauge what’s popular or trending, and the buttons at the bottom of the screen are useful with navigation, but it feels like something is missing, and not just a slide-out menu. Favorites, Explore and Search can easily be merged into a single tab, freeing up two slots that can bring Apple News to the next level. 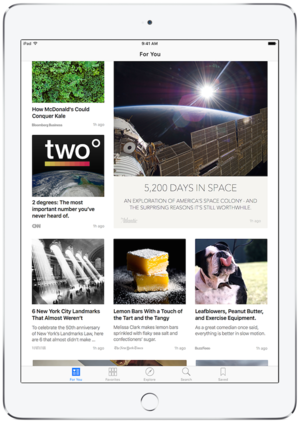 When I first started using Apple News I was surprised that Reading List wasn’t included. I don’t use Safari’s Reading List feature, but I’m constantly saving stories to my Instapaper queue. Even if the stories are from sources already in my Apple News feed, there’s no guarantee I’m going to find them, especially if I don’t get to it for a few days. If Apple News could pull in my Instapaper queue or Safari Reading List into a synced tab, I’d spend a lot more time with it. The Shared Links feature in Safari would be just as useful. In the browser, this feature collects a chronological list of links posted by your Twitter friends, but adding it as a tab in Apple News would bring a breaking-news component that the app currently lacks. I suspect it’s a fairly underutilized feature in Safari, but in Apple News it would be an excellent companion to your main feed, offering news as it happens and opening up another avenue for exploration. 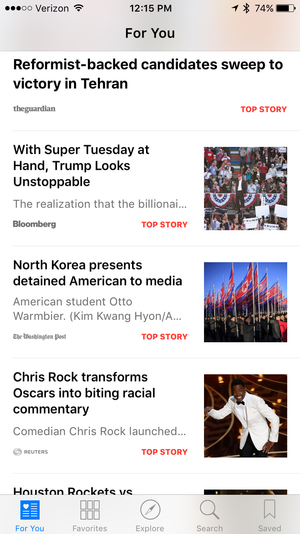 For a reading app with an emphasis on personalization, there’s a surprising lack of customization in Apple News. The only options you’ll find are back in the Settings app, where you can toggle minor things like background refreshes and RSS previews. An iBooks-style settings pane with themes, fonts, and brightness customization would go a long way here, as would the ability to view stories in Safari’s stripped-down Reader mode. Can I get a list of all the Top Stories, please? But these are superficial improvements that would mostly benefit current users, not entice new ones. To that end, it first and foremost needs a presence on all devices. The lack of a Mac app is a glaring omission, but an Apple Watch component would helpful too, alerting you to articles a they arrive and letting you quickly flag headlines for later viewing. 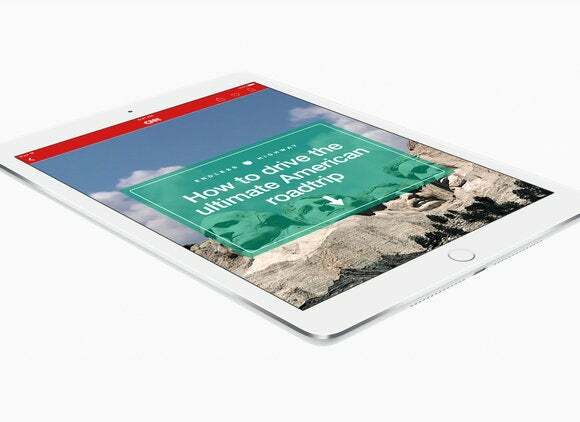 Above all, the killer feature Apple News is missing is a digest. Through the day, Apple News labels a handful of articles with “Top Story” tags, but they’re easy to miss, especially if you don’t routinely check the app. A digest could key you in to what’s happening without the need to scroll through hundreds of headlines. And much like Apple Music’s For You recommendations help you find music from lesser-known artists, Apple News could use its editors and algorithms to spotlight smaller publishers and interesting stories that you might otherwise scroll past. In today’s 24/7, multimedia news culture, words are only part of the story. Apple News already incorporates photos and videos into its article presentations, but that’s the same as other sites or services. Apple just happens to own a radio station. While Beats 1 is devoted to music, Apple has already filed trademarks for Beats 2–6, and I could imagine a radio channel providing breaking coverage and analysis of the most popular stories on Apple News. Above all, news readers need content to thrive. There are rumors that Apple will be working to offer subscriptions directly within the app, but I wonder if there’s a new model that follows Apple Music’s all-you-can-eat format. Perhaps Apple could collect a selection of articles each day from premium publishers and charge a monthly fee to read them, or even commission exclusive articles available only to subscribers. Any journalist will tell you that it’s not the news industry that’s dying, it’s the distribution method. It’s kind of like the problem the music industry had before the iTunes Store paved the way for change, and with the right changes, Apple News could do the same for publishing.